Keywords Based LKPD Environment, Motivation and Learning Outcomes. Knowledge Dimension, Factual, Metacognitive Learning Tool, Cooperative Jigsaw mode, and Concept solution. NHT, 4-D models, cooperative, environmental, and colloidal systems. PBL, Direct Learning, Learning Motivation, Learning Result Problem Based, Guided Inquiry, Motivation, and Learning Result. Project Based Learning, 4-D models, and analysis titrimetric Think-Pair-Share (TPS), Direct learning, Initial Ability, Learning Outcomes development, assessment, performance, attitude, practice. instructional model, learning style, critical thinking ability. Chemistry Education Review (CER) is a peer-reviewed scientific open access, with e-ISSN : 2597-9361 and p-ISSN : 2597-4068 published by Chemistry Education Study Program, Graduate Program of Universitas Negeri Makassar in 2017. 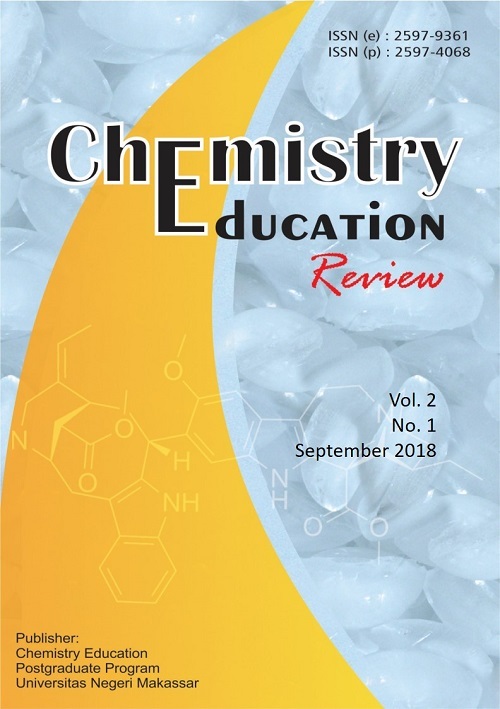 Chemistry Education Review is an-Opened Access journal and published twice a year every September and March. It publishes the research (no longer than 5 years after the draft proposed) in term of Chemistry Education which relate to chemistry study and learning, theory and educational practice, educational policy, curriculum development and learning material, cultural education and national character, teacher education and training, technology and learning media, or every relevant activity. Chemistry Education Review (CER) is licensed under a Creative Commons Attribution-NonCommercial 4.0 International License.